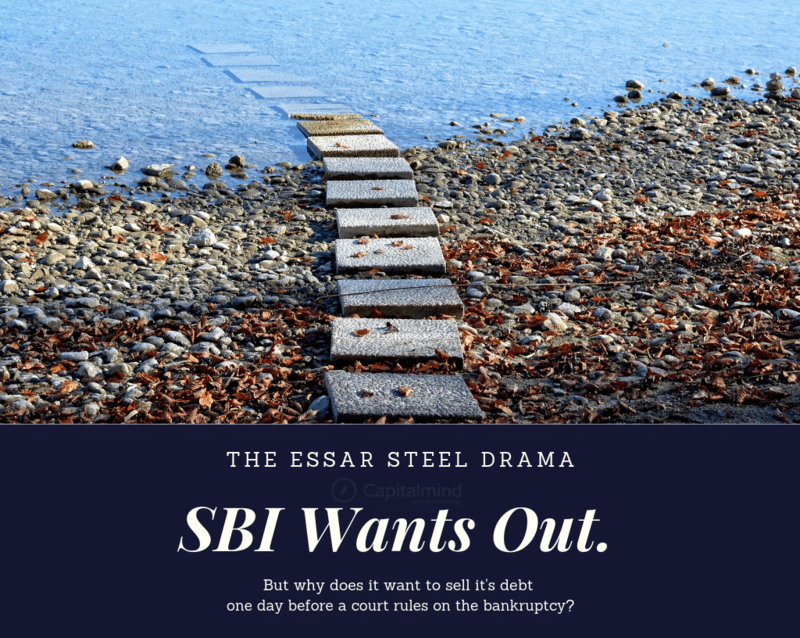 Opinion: Why Is SBI Selling the Essar Steel Debt, One Day Before A Court Decision On The Resolution? Essar Steel owed around Rs. 47,000 cr. to banks. The court says no, let this go on. The Ruias try to use a backdoor entry through an entity in which a connected party has a stake – this entity was called Numetal. Numetal bid for the company. But under the IBC law the promoters of a defaulted entity can’t be a bidder. Arcelor Mittal too had a bid, and they also had been promoters in two defaulted entities (KSS Petron and Uttam Galva Steels). Mittal then paid the money for those companies and stayed in. Numetal had to get rid of Ruia’s link as a shareholder, and they did. Eventually Arcelor Mittal won the bid, at about Rs. 42,000 cr. with a further Rs. 8000 cr. injection into the company. The Ruia’s then put another bid – Rs. 54,389 cr. A promoter can still pay up the loans in full and take the company out of the process. But obviously it is unfair to wait till the time that the last bid is in, and then after the winner is selected, put your bid in. They haven’t said where they got the money. And why, if they had it, they didn’t put it back before. It’s likely they wanted the banks to agree to a haircut, which is what banks would have agreed to earlier, until the bankruptcy law came along and doused those dreams. However, courts will have to decide if that bid is legal. As of now, the banking system supports Mittal’s bid. The NCLT (effectively the bankruptcy court) had adjourned hearings twice, until the NCLAT (the appellate tribunal) told them on Jan 3 – get your act together and put an order in. The case will be decided on Jan 31, 2019. Or so we believe. Which could easily take a year or more! You can’t expect the Ruias, who have been in business for this long, to give up too easily. 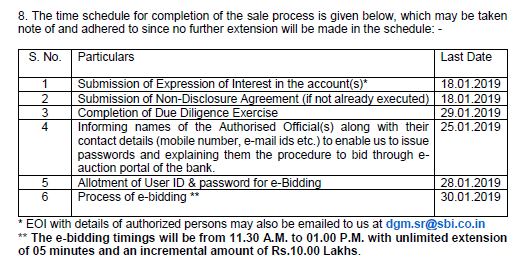 So SBI is selling the portion of debt owed to it, to financial institutions. the money they are owed is about 15,431 cr. That 11,313 cr. is something they expect to recover only after a year (courts etc.). So they use an interest rate of 18% to discount the amount by one year, to get 9587.64 cr. The buyer of this debt will then have to pay Rs. 9587.65 cr. upfront. And if things go okay, the buyer is likely to get the money in a year, in which case they make 18% returns. (This is pretty standard return for a risky asset, so don’t read too much into it). They say, officially, that they don’t want to wait a year. Just get it out of the way already. 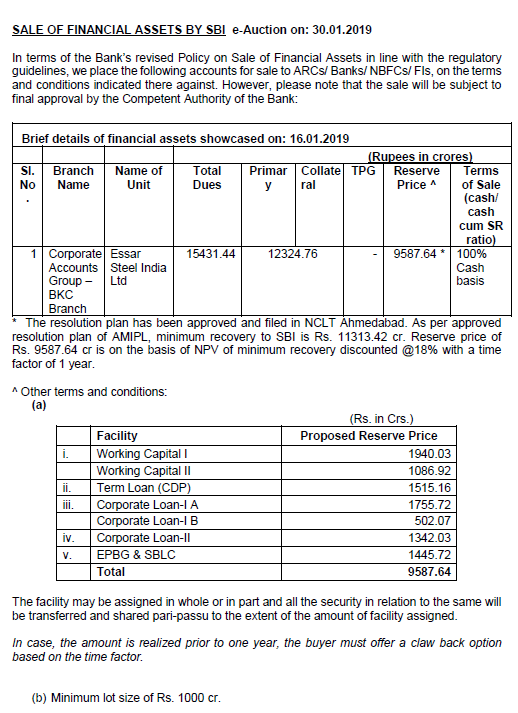 It will actually result in a profit – because SBI would have written down 50% of the loan (7715 cr.) and even a discounted sale like this would give them a profit of about Rs. 1,900 cr. more! That adds to their capital, which means they can lend more. That’s the official reason. But there is potentially a more sinister reason that this is happening. Here’s a conspiracy theory. It’s totally made up, so don’t assume it’s based on any truth or fact. The Ruia’s have been close to many political parties. They don’t want to lose the steel asset. They can’t bid and their bid may not be accepted by the court. But even if the court does allow the Ruias to bid, the current set of banks apparently is so against the Ruias that they are likely to vote a no. In fact, they did, earlier, say that they would rather take a haircut from the Mittal bid (and lose some money) rather than give the Ruias a chance to take this back. There’s merit in that argument. Mittal’s produced the cash to pay for the asset. The Ruias have not. Meaning: if they say ok to Ruia, they stand a good chance that Ruia will say he doesn’t have the money, and go right back to the same banks to borrow it – which means they’re back to square one. How do you solve this? You can’t. For that, you need a 25% stake at least. Which is what SBI has, right now. And then, get that debt acquired by a “friendly” party who will then do what you want them to. We don’t know if this is true, but it could be a mechanism used to complicate the deal going forward. And there are questions. Why Now? Why Not After 31 March? So everything will be done by the 30th of Jan. It’s a little strange to do that when there’s an order coming on the 31st, you would think? What if Arcelor Mittal Bids? If the resolution is scuttled by the court, they can then stop any further attempts to sell to Ruia, because they’ll have the voting rights. The fight between the two could mean that the bidding sees a price war – and thus, SBI could get more money. In fact, this could really be the goal – to get them to fight through proxies and get SBI even more money than the reserve price of 9587 cr. This sale benefits SBI. They get less than they had anticipated but at least they get it now. But if it does go through and any party manages to delay the process even longer, then the bankruptcy concept will suffer. It was intended that the company would be revived and fast. But this will hold things for even longer because one party doesn’t want to lose it. The conspiracy theory may not be true, but it does provide leverage for the Ruias or the Mittals to target the entity that buys this debt. If it turns out that a sinister motive was involved, then this becomes the modus-operandi of all the other people who stand to lose their companies to the Bankruptcy courts. We’ll just have to wait for the court decision, but something tells us the story isn’t anywhere close to over because the fat lady is still putting on her makeup.